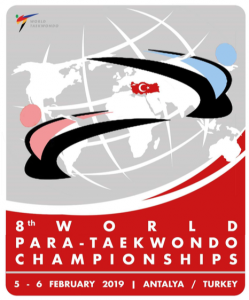 On 2nd February the British Taekwondo Para-Poomsae Team flew out to the Para World Championships in Turkey alongside the GB Para Kyrougi Team. 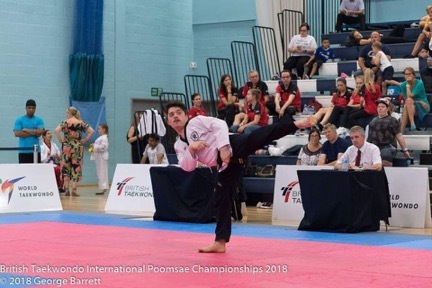 Unfortunately, from the 10 selected poomsae players selected only 7 could attend, so we are missing two European Gold medallists from the team. The team has a mixture of experienced Medallists: Current World and European Champion (2017) Bradley Brockies (P20 Junior Male) and Samantha Carrington the current World Champion (2017) (P33 Female), and World Bronze & European Silver Medallist (2017) Rajinder Chatha (P20 +31M) and Benjamin Savage (P20 U30M) is also a European medallist from 2016 in another classification category. Alongside this experienced team are new team members Kieran Wroe (P20 Junior Male), Gabrielle Toas (P20 U30F) and Lewis Currie (P30 Male). The team arrive in Turkey ready for two days of intense preparation ready to compete on Tuesday 5th February. The coaches for the team are Head Poomsae Coach; Gemma Biescas, Para-Coaches; Russell Watkinson & Terry Cooper. 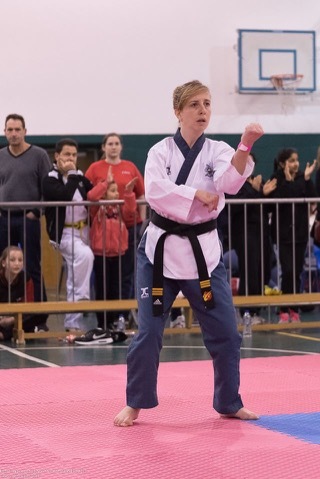 The newly appointed British Taekwondo President, Sarah Stevenson-Jennings will be attending as a VIP and accompanying and supporting the two teams. My Name is Bradley Brockies and I am 14 years old. 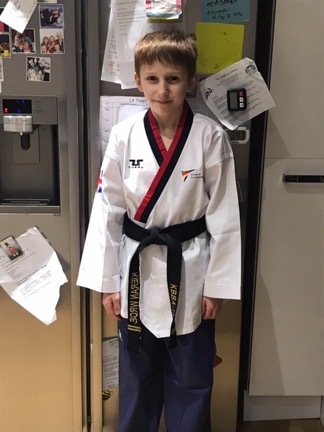 I have been doing Taekwondo at Yong Gi Taekwondo club for 6 years. I am a fully classified para athlete in the P20 Junior Category and the Current World & European Champion. I am a 2nd Poom black belt. I am looking forward to going to the Para World Championships in Turkey to represent my country for the 3rd time. My name is Kieran, I am 12 years old. I have been training with KBBA Taekwondo club for 6 years. I enjoy Taekwondo, fitness and being active. This is my first World Championships and I am really proud to represent my Country. Hi I’m Ben and I am 19 years old. My disability is NFI moderate learning difficulties. I am very proud to be part of the GB para Poomsae Squad for the past 5 years. I am now a 2nd Dan Black Belt at Unite Taekwondo Club in Southport where I started when I was 14 years old. I am really looking forward to going to Turkey and competing at the World Championships. 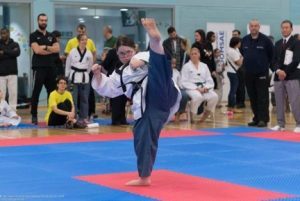 Gabrielle will be celebrating her 18th Birthday by competing for Great Britain at the Para World Championships. Gabrielle is a black belt and trains at Chi Taekwondo in Spennymoor. This is Gabrielle’s first Major Championships and she has been preparing very hard. 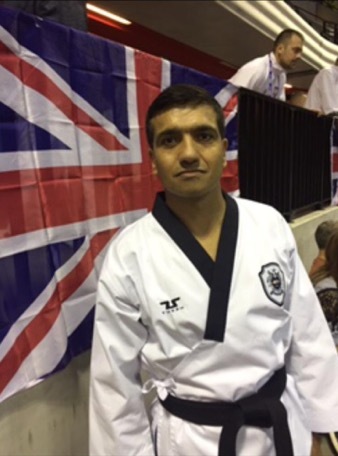 My name is Rajinder Chatha, I have been a members of London Taekwondo Academy for 25 Years. 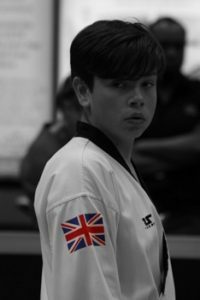 I love this sport and I am proud to represent British Taekwondo GB Poomsae. Rajinder won a Bronze at the 2017 World Championships and a Silver at the European Championships. Hi my name is Lewis and I am 14 years old. I was born 11 weeks premature with Cerebral Palsy. I’ve enjoyed swimming for the last 8 years and I do cycling when I can. 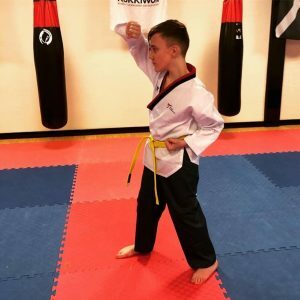 I have practiced Taekwondo at Elite Martial Arts Club for 2 Years and my ambition in life is to prove to others that you can overcome your disabilities, through Taekwondo I feel I am succeeding. I am 31 Years old and I am a Primary School Teacher. I was born with cerebral palsy and always aim to achieve at the best of my ability. I train at Kang Han and have a can-do attitude, I always persevere until I achieve my goal. I started Taekwondo when my physiotherapy stopped aged 18 and I haven’t looked back since. I am currently a 3rd Dan and I am aiming to grade for my 4th Dan Black Belt this year. Samantha is the Current World Champion 2017.